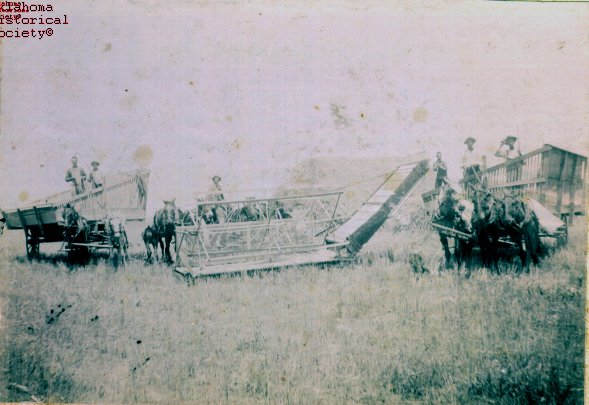 (13704, Oklahoma Historical Society Photograph Collection, OHS). The parcel of Oklahoma land now called Harper County began with the Cherokee Outlet Opening in 1893; the county itself came from the northwest section of Woodward County in 1907. It is now surrounded on the north by Clark and Comanche counties in Kansas, Woodward and Woods counties on the east, Beaver County on the west, and Woodward and Ellis counties to the south. In 1907 the population reached 8,089 and peaked with 8,189 in 1910. The area was once a part of the Cherokee Outlet, set aside for that nation in treaties of 1828 and 1835. The Outlet was opened for non-Indian settlement in September 1893. Created at 1907 statehood and named for a local pioneer resident, teacher, and clerk of the Oklahoma Constitutional Convention of 1906, Oscar Greene Harper from Missouri, Harper County encompasses a total land and water area of 1,040.9 square miles. Two rivers flow through the landscape of rocky, red canyons in the east and high plains and rolling hills in the west: the Cimarron and the Beaver (North Canadian). Dolby Springs Park, replete with a golf course and an artesian well, lies ten miles northwest of Buffalo, the county seat. The county produces wheat, cattle, petroleum, natural gas, and gypsum. Early-day residents supplemented their farming and ranching livelihoods by selling dry bison bones. Sinclair Prairie Oil Company drilled the county's discovery well in 1930. Presently, education, oil and gas, and government services employ the majority of workers. Located in northwestern Harper County along the Beaver River, the Cooper Bison Kill Site represents one of the most significant archaeological sites in North America, providing invaluable information about Folsom culture and ancient bison. Also, the oldest painted object discovered in North America, a more than ten-thousand-year-old bison skull painted with a zigzag pattern, was uncovered there. Before statehood, Indians, mainly Cheyenne and Arapaho, and bison herds freely roamed the terrain. Spanish explorer Francisco Vásquez de Coronado may have trekked through the area in 1541 hoping to find gold. As pioneers crossed the region, several trails developed. The Fort Dodge to Camp Supply military trail, first followed in 1868 by the U.S. Army's Seventh Cavalry, was used to move men and supplies to establish Camp Supply. The Western Trail (also known as the Dodge City Trail) was first used for cattle drives between South Texas and Fort Robinson, Nebraska, in 1874. In 1908 the Cimarron Valley Turnpike Company constructed a bridge over the Cimarron River to facilitate travel between Englewood, Kansas, and Oklahoma. Conceived in 1923, the White River Trail highway intended to join Rogers, Arkansas, with Raton, New Mexico, and would have passed through Harper County; however, because of lack of funding, this enterprise never became realized. Eventually U.S. Highway 64 took the place of the White River Trail. Other major thoroughfares in Harper County include U.S. Highways 183, 270/412, and 283 and State Highways 3, 34, 46, and 149. U.S. 183 and U.S. 64 intersect in Buffalo near the center of the county. Historically, Harper Countians made their own successes. For example, in the early days residents built a considerable trade in salt gathered from the Great Salt Plain. In 1895 the Ditch Valley Cooperative dug irrigation ditches to use river water to irrigate its members' fields. In 1912 the Wichita Falls and Northwestern Railway, a Missouri, Kansas and Texas Railway (MK&T) subsidiary, was constructed through Dunlap, May, Laverne, and Rosston. In addition, county citizens built their own line, the Buffalo and Northwestern Railroad (B&NW), to connect Buffalo with Waynoka in 1919–20. The Atchison, Topeka and Santa Fe Railway acquired the B&NW in 1920, and the MK&T line was abandoned in 1970. Buffalo presently serves as the headquarters of the Oklahoma State Highway Department's Sixth Division and supports the Harper County Community Hospital. Started in 1937 by Dr. Earl F. Camp, it is the county's only hospital. The county enjoyed telephone service beginning in 1907. Harper County's first newspaper, the Brule Post, began publishing in June 1905 with William Forester as editor. Currently, Buffalo (the Harper County Journal) and Laverne (the Leader Tribune) each publish a newspaper and have the county's only public schools. Other incorporated towns are May and Rosston, and unincorporated communities include Dunlap, Willard, and Selman. Towns no longer in existence include Doby Springs, Paruna, Flat, Avis, Readout, Cross, Alto, Cupid, and Stockholm. A county seat "fight" was waged between Doby Springs and Buffalo, with Buffalo winning the title by 111 votes in 1908. Harper County's brush with fame came in September 1934 when Charles A. Lindbergh, his wife Anne Morrow Lindbergh, and their plane made an emergency landing on the Homer Aitken farm situated between the communities of Fern and Selman. News of the famous couple traveled fast and drew many visitors until a replacement part for the plane arrived, and the Lindberghs took to the skies again. Notable Harper Countians include 1936 Olympic heavyweight wrestler Roy Dunn, 1967 Miss America Jayne Jayroe, and songwriter Jimmy Webb ("MacArthur Park," "Up, Up, and Away," and "By the Time I Get to Phoenix"). The U.S. Censuses have recorded a dwindling population for Harper County over several decades. The 1910 peak of 8.189 was followed by a decline to 7,761 at the beginning of the 1930s Great Depression. The number of inhabitants stood at 5,977 in 1950, at 5,151 in 1970, at 4,715 in 1980 and at 4,063 in 1990. The 2000 population of 3,562 comprised approximately four persons per square mile. The 2010 census counted 3,685, of whom approximately 87.4 percent were white, 0.8 percent American Indian, 0.2 percent Asian, and 0.1 percent African American. Hispanic ethnicity was identified as 17.4 percent. The leading employers were health care, the retail trade, and transportation providers, and cattle feed yards also provided income. Since 1940 an annual Old Settlers Picnic has been held to commemorate the county's heritage. Lee M. Foster, "A History of Harper County" (M.A. thesis, Oklahoma A&M College, 1939). Harper County Historical Society, Sage and Sod: Harper County, Oklahoma, 1885–1973, 2 vols. (N.p. : Harper County Historical Society, 1974–75). Sara Jane Richter and Tom Lewis, "Harper County," The Encyclopedia of Oklahoma History and Culture, https://www.okhistory.org/publications/enc/entry.php?entry=HA029.